Take a few swings off your game by downloading the Golf Score Sheet. This free document will help you track your golf score. All you need to do is enter the required information listed for each section and the free template will take care of the rest. This document even provides you with a helpful graph that shows you when your best strokes were. You can use that information to analyze your game more in-depth. If you’re someone that has always wanted to improve their golf game but have always found it to be a difficult task, try this free template and see if it’s a hole-in-one! After downloading the free template, start by entering your handicap in the indicated “My Handicap Index” cell at the top of the page. You will then scroll down to the main table at the bottom of this template to start entering your information. At the end of each game you play, you will enter in the following information into the document. First, list the date, the number of holes you played, the course, your best average, the score over par, and any notes that you may think will come in handy to improve your overall game. These can be anything from weather conditions to sand traps that were notably tricky to escape. You can even enter a different handicap for individual courses in the right-hand table as well. 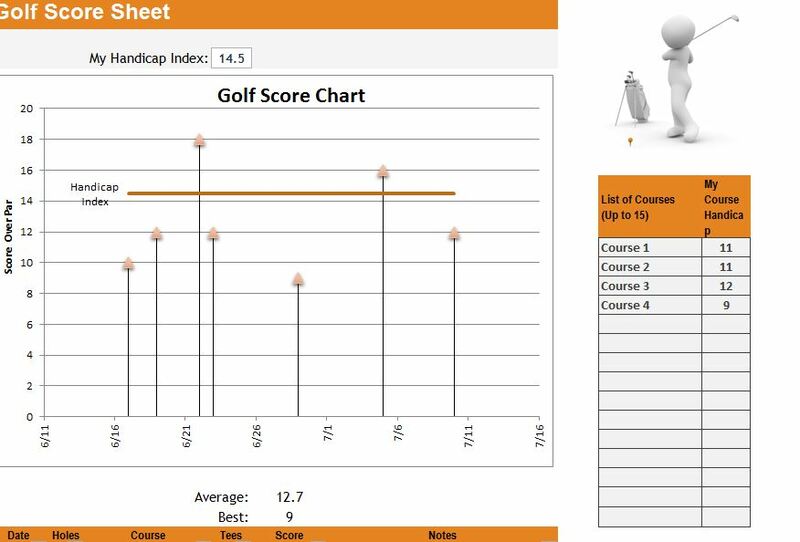 You will also notice that there is a large graph at the top of the page, denoting your handicap index level compared to your score over time. With this tool, you will see how you’re improving or not improving and take action from there. By analyzing the trends in your golf game, you can start to rule out outliers and weather conditions that play a role in your score. You can also try to improve your game gradually over time, using this template as a starting point.